In mid-May, the Nursing Department at the American Samoa Community College (ASCC) celebrated the certification of 11 student nurses with a Pinning Ceremony that took place in the auditorium of the College’s new Multi-Purpose Center, with Nursing Department chairperson Lele Ah Mu presiding over the event. Joining the Nursing Department faculty, students and professional advisors for the ceremony were Lieutenant Governor Lemanu Peleti Palepoi Sialega Mauga, who also provided the evening’s special remarks, Board of Higher Education chairman Rev. Dr. Leanavaotaua Sekuini Seva’aetasi; ASCC President Dr. Rosevonne Makaiwi-Pato and members of the College’s administration; Rev. Manuele Mataafa, CCCAS Poloa; Representative Talalelei Fautanu Jr., Chairman of the Health Committee; Department of Health Director Tuileama Nua; LBJTMC CEO Faumuina John Faumuina; Ofu & Olosega Representative Toeaina Autele; and the family and friends of the graduating nurses. Of the 11 ASCC student nurses honored during the ceremony, Ruby Fia, June Fuiava-Fa’apue, Toetuua Iosefa, Tualupetu Lauina, Mautumua Maulupe, Sweetheart Nua, Kristal Tautolo, and Kimberly Ueligitone now have their licenses as Practical Nurses, while one additional PN candidate, Ferila Metuli, will re-take the NCLEX-PN in July after her initial testing process was compromised due to computer error. 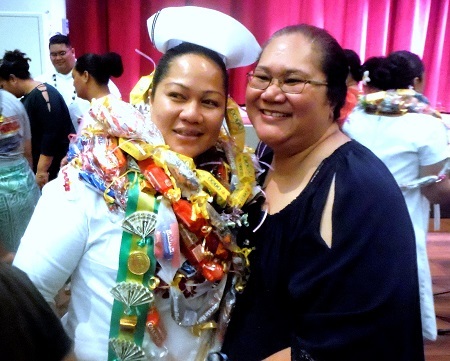 RN candidates Ria Lefiti and Tiffany Taumua have completed their program requirements and will soon take the NCLEX-RN for their certification as Registered Nurses. The Pinning Ceremony involves both nursing professionals and the family members of each respective student, who each perform a part in conferring each graduate’s official nursing pin and cap. The graduates received additional words of encouragement in the addresses by Lt. Gov. Lemanu, ASCC President Dr. Makaiwi-Pato and keynote speaker Sylvia Tauiliili, RN, MPH. For more information on the ASCC Nursing Program, see the College’s Catalog, accessible online at www.amsamoa.edu.